Nationaltheatret opened in 1899. The main building, designed by architect Henrik Bull, is situated in the centre of Oslo, close to the Royal Castle and the old University. 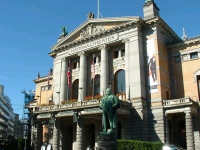 Today, Nationaltheatret is one of Norway�s five national theatres, and regularly presents classic and contemporary plays on five different stages, one of which is situated in the annex at the Torshov Theatre in eastern Oslo. The stages are: Hovedscenen (Main Stage) - 750 seats, Amfiscenen (Amfi Stage) - 200 seats, Bakscenen (Backstage) - 100 seats, Malersalen (Paintshop) - 60 seats and, Torshovteatret - 150 seats. On different occasions, eg during festivals, the theatre will also give performances, readings and happenings in other arenas – inside or outside the building. The theatre�s ensemble of 70 include some of Norway�s finest actors. Almost 200 people - actors, technicians, producers, administrators - work on a permanent basis at Nationaltheatret. Nationaltheatret is known as 'The Henrik Ibsen Theatre'. Every second year, the theatre organises the international Ibsen Stage Festival. In addition to the theatre�s own Ibsen plays, the festival invites Ibsen productions from all over the world. In 2006, centenary of Ibsen�s death, the theatre presented the biggest Ibsen Stage Festival ever. With a central location in the capital and a leading position in theatrical life, the National Theatre, Oslo is Norway�s principal theatre. The National Theatre company has always included leading dramatic artists, actors, directors, stage designers and composers, providing a repertory of new and classical Norwegian drama as well as contemporary foreign plays, thus creating as many opportunities as possible to cultivate variety and versatility. The National Theatre celebrated its 100th anniversary during the season of 1999-2000. The home of the National Theatre company comprises three stages – Hovedscenen, Norway�s principal theatre stage built in 1899 in late Rococo style, which stages repertory theatre; Amfiscenen, a flexible space refurbished in 1999; and Malersalen, a small studio theatre often used as a rehearsal studio. Seating: 65 removable seats total; performing area: flexible within total auditorium dimensions 10.8m W x 10m D x 3.7m H; suspension equipment: overhead pipe grid for suspension of masking and lighting; soft hangings: black legs and borders; lighting: AVAB 90-channel computer control, 32 x 2kw dimmers, no permanent luminaries; sound: no installed equipment; backstage: facilities shared with main auditorium; Air-conditioned and heated, availability: available through partnership arrangement only.